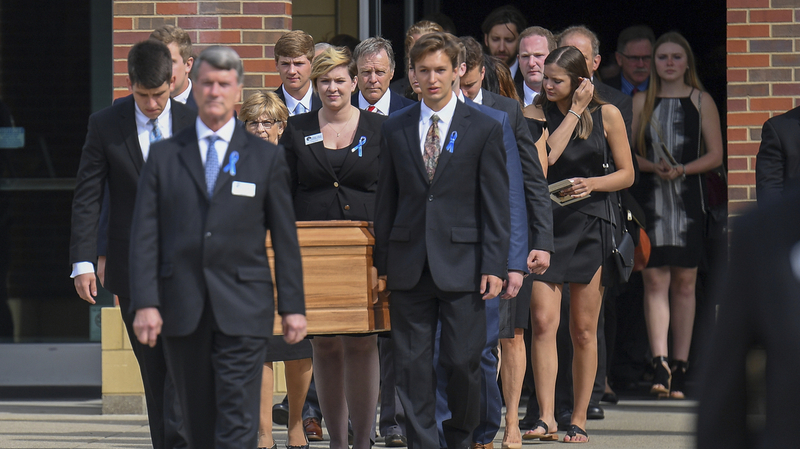 Mourners Remember Otto Warmbier At Hometown Funeral : The Two-Way The 22-year-old university student died Monday, after returning from North Korea in a coma. Mourners carry the coffin of Otto Warmbier after his funeral Thursday. The funeral was held at Wyoming High School, outside Cincinnati. Throngs of mourners paid their final respects to Otto Warmbier Thursday at a public funeral at the high school he attended near Cincinnati. Just four years ago, Warmbier graduated from the school as the salutatorian. The 22-year-old University of Virginia student was detained in North Korea for 17 months and died on Monday, shortly after he returned to the United States in a coma. "It doesn't really feel real yet," his former soccer teammate Grady Beerck said, according to The Associated Press. "He's so young, and he's been gone for so long. The impact he made is always going to last with people." Beerck described Warmbier as a "goofy kid" who would "drop anything to help his friends." An estimated 2,000 people packed Wyoming High School, in Wyoming, Ohio, with more lining the streets, CNN reports. The service took place in the arts center, which could hold only 800 people, so many more watched on screens set up in overflow rooms. Warmbier's brother, sister and friends spoke at the service, NPR member station WVXU in Cincinnati reports. Inside the arts center, some of the personal items Warmbier took to North Korea were on display: a wallet, a University of Virginia notebook and the cream-colored linen blazer he wore there, CNN says. Warmbier's North Korean trip was only supposed to be a five-day tour. But he was arrested in Pyongyang in January 2016 and, as we have reported, was accused of trying to steal a propaganda poster. He was sentenced to 15 years in prison and hard labor. Warmbier was returned to the United States last week in a coma. North Korea said he had contracted botulism and that it was releasing him on "humanitarian grounds." But the doctors who examined him after his return disputed the botulism claim and said he had "extensive loss of tissue" in his brain. Ohio Sen. Rob Portman, who had met with North Korean officials in New York to press for Warmbier's release, attended the funeral. "North Korea needs to be held accountable for what happened to Otto Warmbier," Portman said. "They've shown through their treatment of Otto a disregard for basic human rights, for human dignity." Portman said sanctions against North Korea should be tightened, WVXU reports. As a hearse carried Warmbier's coffin away, some mourners held up their fingers in the shape of a "W," for his name, according to AP. A Hamilton County Coroner has not yet determined Warmbier's cause of death. According to his family's wishes, no autopsy was performed. But a statement from the coroner said, "There are additional medical records and imaging to review and people to interview."